ISO-2846-1 CERTIFIED One ink for ALL your printing needs! 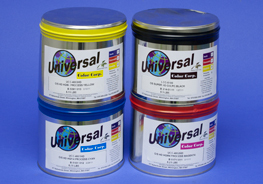 The HGM4 series is the most popular ink on the market today! Tested against the top competition, it has outperformed all in every aspect of print quality. Approved for SWOP and G7 color management. The HGM4 Process Series can do every job in your plant. It's the only ink you need in your inventory! Has the most stable and balanced dot, thus producing a very neutral gray balance which is critical in proof-to-press matching. Works with all fountain solutions with a very stable ink/water balance—from quick start-ups to long runs. The most exceptional quality of the HGM4 is that it stays open on-press for 4 days yet will dry on any substrate. Prints on Yupo®, Tyvek®, Kivar®, metallic, matte, and any difficult offset stock. Dries to a tough film yet stays open on-press and prints on your everyday stocks which means no more scooping the fountain to go from one job to the next—saving on downtime and wasted ink. HGM4 is Aqueous Coatable, UV Coatable, Laser-Safe, and will accept film laminate.